Expulsion in the Fifteenth Century. Jews Again in Ulm in the Sixteenth Century. City and district of Württemberg. As in many other German cities, there is in Ulm a legend that Jews lived there before the Christian era;but the first historical evidence of a Jewish settlement is a tombstone dated 1243 and erected in memory of Huknah, daughter of R. Solomon ha-Levi. The next oldest record is a declaration, issued by the city council of Ulm in 1274, which terms the Jewish community a privileged "Darleihergenossenschaft" (loan society), fully authorized to dispose of unredeemed pledges. By the aid of a Jew the Bavarians, who in the fourteenth century were at war with Austria, succeeded in reducing the city (April 20, 1316); and eight years later (Nov. 10, 1324) Louis the Bavarian pledged to the counts of Öttingen the state taxes payable by the Jews of Ulm. In like manner Charles IV. pawned the Jewish taxes of Ulm to Albrecht of Rechberg; and the Jews of the city thus found themselves compelled to collect part of their taxes from their coreligionists of Schelklingen and Ehingen. The Jews of the latter place, however, complained of this procedure; and on Aug. 1, 1348, the Jews of Ulm were officially reprimanded. The imperial prefects of Swabia finally took them under their protection on condition that they paid their "Schutzgeld" (protection-money) promptly. The other fees which they gave for protection went to the city treasury of Ulm, and were used to defray the cost of new fortifications. About this time the Jews of Ulm were accused of poisoning the wells, and were persecuted by mobs, while the city council, on being called to account by Count Helfenstein, declared itself powerless to check the rabble. The property of the victims was attached by the city authorities; and on this occasion a letter from the Jewish community of Jerusalem, informing the Jews of Ulm of the crucifixion of Jesus, is said to have been found (Nübling," Die Judengemeinden des Mittelalters," p. 300, Ulm, 1896). On the career of the "Grossjuden" Jäcklin, who was an important figure in Ulm during the latter half of the fourteenth century, see Jew. Encyc. vii. 19. (1) The city of Ulm is granted the privilege of admitting Jews and Jewesses. (2) One-half of the Jewish taxes is to be paid to the city, and the Opferpfenning is to be paid during the week preceding Christmas. (3) Jurisdiction in loan proceedings is vested solely in the supreme court of Ulm. (4) For a period of ten years a large sum of money is to be paid the city by all the citizens of Ulm as well as by the Jews. There are no records extant showing the size of the Jewish community of Ulm at this period; but the frequency of the family names "Ulma" and "Ullmann" points to a numerous congregation. That it took high rank in spiritual affairs is evidenced by the fact that it possessed a yeshibah, over which R. Simelin presided. In addition to Simelin, there were three other rabbis in Ulm; namely, Seligmann, Lafen, and Gershon. Simelin violated a regulation, issued by the community of Nuremberg, to which he had himself subscribed; and the result was a controversy which involved the entire congregation. Simelin and the leaders of the community finally brought the matter before Jacob Weil for adjudication; and the latter decided that Simelin should make a public retractation of his utterances in three different communities, or suffer the penalty of excommunication. (1) The Jews must weigh on "sworn money-scales" ("Geldwage") everything which they buy or sell. (2) From Palm Saturday until Easter Wednesday, as well as on Corpus Christi Day, all Jews must remain within the Jewish quarter; transgressions of this ordinance will be punishable with a fine of five pounds heller. (3) Any discourtesy shown a Jew by a Christian will be punished twice as severely as if shown to another Christian. (4) A Jew may not lend money on a pledge unless be knows the debtor well. (5) No Jew may have a Christian servant in his house. 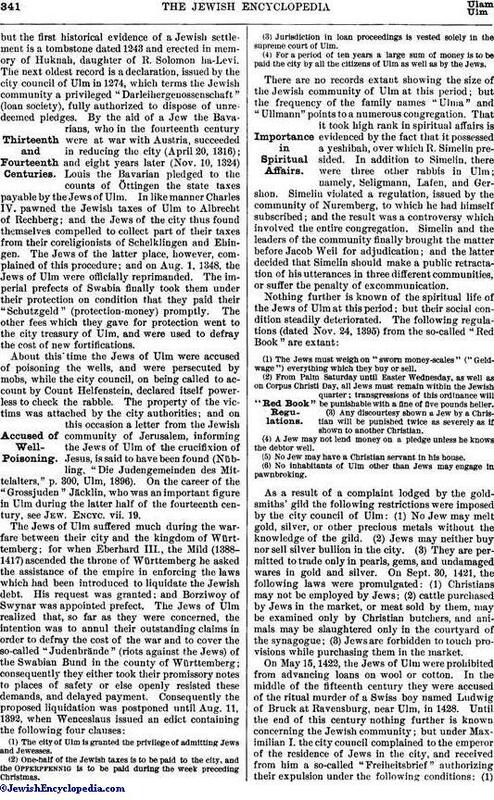 (6) No inhabitants of Ulm other than Jews may engage in pawnbroking. As a result of a complaint lodged by the goldsmiths' gild the following restrictions were imposed by the city council of Ulm: (1) No Jew may melt gold, silver, or other precious metals without the knowledge of the gild. (2) Jews may neither buy nor sell silver bullion in the city. (3) They are permitted to trade only in pearls, gems, and undamaged wares in gold and silver. On Sept. 30, 1421, the following laws were promulgated: (1) Christians may not be employed by Jews; (2) cattle purchased by Jews in the market, or meat sold by them, may be examined only by Christian butchers, and animals may be slaughtered only in the courtyard of the synagogue; (3) Jews are forbidden to touch provisions while purchasing them in the market. On May 15, 1422, the Jews of Ulm were prohibited from advancing loans on wool or cotton. In the middle of the fifteenth century they were accused of the ritual murder of a Swiss boy named Ludwig of Bruck at Ravensburg, near Ulm, in 1428. Until the end of this century nothing further is known concerning the Jewish community; but under Maximilian I. the city council complained to the emperor of the residence of Jews in the city, and received from him a so-called "Freiheitsbrief" authorizing their expulsion under the following conditions: (1)The Jews were to be given the shortest time possible in which to dispose of their movable property. (2) The proceeds of the sale of the synagogue, cemetery, hospital, bath, dwelling-houses, and the like, together with their appurtenances, were to accrue to Wolf of Asch, the prefect of Geislingen. (3) All former privileges were to be annulled. (4) After the date of the expulsion every Jew remaining in the city was to be outlawed. This manifesto was published on Aug. 6, 1499; and after four days the imperial treasury sold to the city of Ulm for 5,000 gulden the real estate belonging to the Jews, the date of the expulsion being set for five months later. No Jews were again admitted to any town in the district of Ulm until 1526, when one was allowed to settle in Albeck, on condition that he charged interest at the rate of 1, and not 2, heller per gulden. In a short time this Jew succeeded in bringing coreligionists to the district, and the council of Ulm again complained to the emperor; whereupon, on July 18, 1541, Charles V. issued a "Freiheitsrecht" from Regensburg, containing the following clause: "This Jew is not permitted to borrow money. If he does so, he is liable to a fine of 10 marks in gold; and the money, together with interest, shall go to the city of Ulm." Further, a debtor was forbidden to waive his rights under the "Freiheitsbrief" in favor of his creditor; this rendered it impossible for the Jews to remain in the city. A second "Freiheitsbrief" was issued by Ferdinand I. (Vienna, March 28, 1561); and throughout the seventeenth century Jews were found in the district of Ulm only during the Diets, as imperial or princely envoys, or when traveling with safe-conducts, although occasionally they sojourned for some time in the city, and even had their own slaughter-houses. During the eighteenth century the condition of the Jews improved slightly. On Jan. 19, 1712, the council permitted them to attend the horse-markets on payment of 10 kreutzer per diem; but they were forbidden to peddle leather. In the middle of the eighteenth century, however (May 20, 1750), they received permission to attend all the fairs and to deal in wares of any kind. They were charged 1 gulden a day for the privilege of staying in Ulm; and their safe-conducts cost 3 kreutzer per hour. At the outbreak of the French war several Jews went to Ulm, among them being the army contractors Kaulla of Hechingen, and Gumberz, manager of the Stadt-theater in Ulm. When the condition of the Jews in Württemberg was regulated (1827) and civic equality was granted to them, the Diet of Ulm lodged an unavailing protest. Soon afterward the special taxes levied on Jews for protection and the like were repealed. 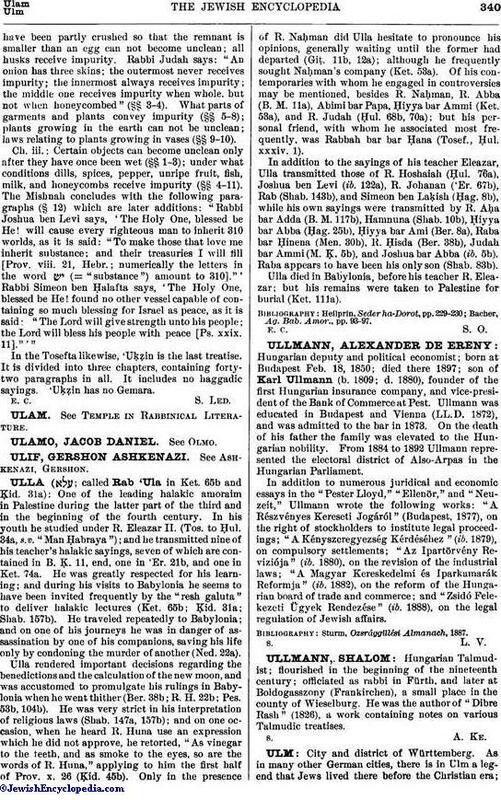 On Feb. 3, 1845, the Jews of Ulm organized divine services, Simon Einstein of Laupheim being chosen ḥazzan. 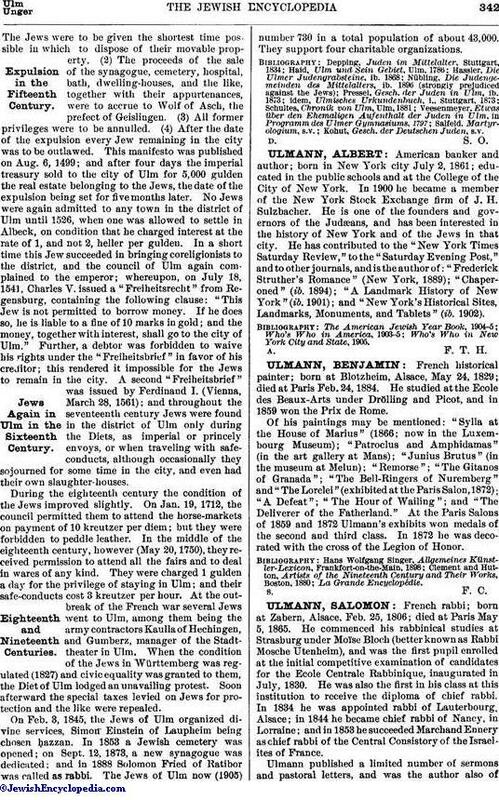 In 1853 a Jewish cemetery was opened; on Sept. 12, 1873, a new synagogue was dedicated; and in 1888 Solomon Fried of Ratibor was called as rabbi. The Jews of Ulm now (1905) number 730 in a total population of about 43,000. They support four charitable organizations. Kohut, Gesch. der Deutschen Juden, s.v.